These ideas, catch phrases and concepts have infiltrated the church and have laid a false foundation. 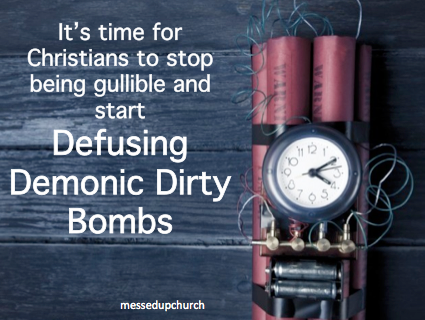 They’re a “set-up.” Because many Christians believe these things, false teachings are slipping into the church all over the place. Christianity is a specific set of beliefs that is based on one holy book: The Bible. “Sola Scriptura” is the Latin phrase meaning “Scripture Alone.” This principle was firmly established during the Reformation in stark contrast to the Roman Catholic Church, which claimed that church authority (the Pope) was equal to scripture. Because we believe the Bible is God’s Word, we must also believe that some ideas are incompatible with the Bible and must be rejected as false. While it’s true that Christians should not be primarily negative and critical people, we should be willing to say negative and critical things about false teachings, because bad doctrine is very harmful-it leads people away from God. The painful reality is that false teachers are great manipulators and they know exactly what to say in order to keep your trust (and keep their money pouring in), so sometimes it’s necessary to say negative and critical things to confront them and their teachings. The Old Testament prophets, Jesus and all the Apostles did this. We should not be primarily thinking “positive versus negative;” instead, we should be thinking, “true versus false.” The Bible is not always a “positive” book because it contains the truth that we need to hear. We humans are like disobedient children who need correction from our Heavenly Father, who loves us enough to tell us the truth. We have millions of Christians watching 10, 20 or even 30 hours of television per week, yet they don’t have time to read and study the Bible. But when the latest guru comes along with a new method of “hearing from God” they drop everything to “learn the secret;” yet, they’ve neglected God’s Word-the actual words from God. The situation should be seen as utterly absurd, yet since almost everyone behaves and believes this way, it’s been normalized. As a result, false teachers have free reign and a limitless customer base to promote their weird ideas and enrich themselves. While it’s true that some people have very real and emotional experiences with God, this should not be where we establish our belief system-God’s Word does that. God has graciously given us the safe parameters within which we can understand Him-in His Word. But if a person depends on experiences they can easily become dependent on more experiences, which will usually escalate into an emotional train wreck. Just ask anyone who has left a Charismatic/Pentecostal church in a state of confusion, never to return. Sometimes, this anti-intellectual sentence is used in a sermon as if it were scripture. It’s not-it’s just another (stupid) catch phrase. And it can be very manipulative and confusing. If anybody tries to be discerning (which involves using the mind) they can be dismissed with this Yoda-like catch phrase. God did not give us a mind and then expect us to stop using it. Ironically, when a false teacher says things like this, he is using a type of thinking to convince others to think a certain way. Jesus said in Matthew 22:37 “You shall love the Lord your God with all your heart, soul and MIND.” There is no false dichotomy between our heart and mind in scripture-if anything, our heart is not to be trusted, but God’s Word is. In stark contrast, the Jewish believers from Berea in Acts 17:11, “were more noble than those in Thessalonica; they received the word with all eagerness, examining the Scriptures daily to see if these things were so.” If it was good and noble for these Bereans to question the Apostle Paul (who wrote much of the New Testament!) and compare his teachings to scripture (which would’ve been the Old Testament), we can do the same thing with any teacher/pastor. Any pastor/teacher who demands special treatment as God’s chosen and untouchable authority is clearly not! The constant striving to make church “relevant” is usually counter-productive, and the unbelieving world often views our attempts at “marketing God” as shallow pandering. It’s important to understand that some giant “Christian” media companies are owned by even larger non-Christian media companies. For example, Billionaire Rupert Murdoch owns the global media conglomerate News Corporation (Fox News, The Wall Street Journal, Twentieth Century Fox Films, etc., etc. ), which owns Harper Collins, one of the largest book publishers in the world. Harper Collins owns both Zondervan and Thomas Nelson-the two biggest Christian (or “inspirational”) book publishers in the world. These companies are all about making money. It’s crazy to assume that somebody, somewhere is carefully checking the content of every single book they sell. This doesn’t mean that Zondervan and Thomas Nelson don’t have any good books, by the way; it just means there’s no guarantee. This sounds so spiritual, but what does it actually mean? How do we know if the “move” is “fresh” enough? What if the “move” is past the expiration date? How does anyone know for sure that a “move” is really even caused by the Holy Spirit and isn’t just emotional hype-or worse? These questions get completely ignored by most Charismatic/Pentecostal churches, because the assumption is: “we must have a revival!” And it depends on us mustering up something; and one hundred different “experts” have one hundred different opinions on how to make it happen. If we’re talking about computers, recipes, and lawn maintenance… ordinary, regular “stuff;” than of course we can learn from our unbelieving neighbors. But in spiritual matters, the potential for deception should always keep us very close to God’s Word.